Bil‐Jim Construction, Jackson, NJ and Jersey Rents, Bayville, NJ placed the winning bid of $85,000 to claim a Link‐Belt 80 SB Interim (Tier 4) Spin Ace hydraulic excavator. 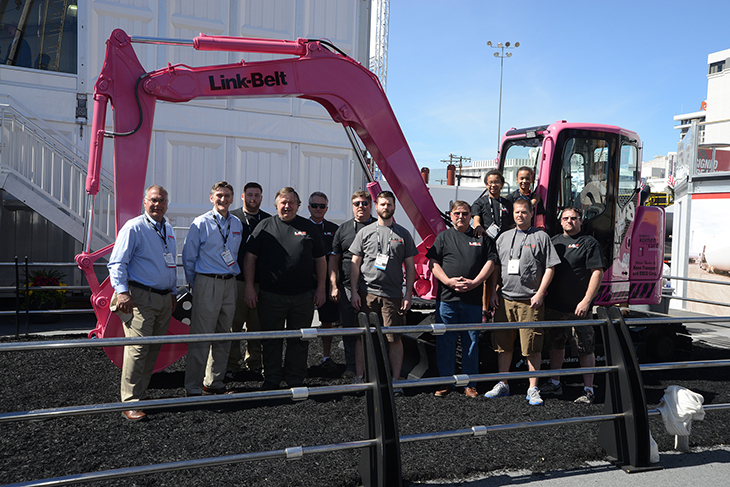 The auction was sponsored by LBX Company, Lexington, KY, and held March 3rd‐7th, 2014, during the CONEXPO‐CON/AGG construction equipment show in Las Vegas, NV. 100% of the proceeds will be presented to the Susan G. Komen Foundation, with half allocated to the national organization, and the remaining half allocated to the local Susan G. Komen chapter in Lexington, KY.
Fondly named “Pinkie Linkie,” the 8.4‐metric ton hydraulic excavator has been on display at various charity events and fundraisers all over Central Kentucky during the past year and a half. The entire machine was painted pink to show support for breast cancer awareness.